A terracotta vessel in the shape of a sphinx, 5th century BC. One of 26 similar pieces discovered in a feminine necropolis ("Demeter's priestess") near Phanagoria. On exhibit at the Hermitage Museum in St. Petersburg. Phanagoria (Ancient Greek: Φαναγόρεια, translit. Phanagóreia) was the largest ancient Greek city on the Taman peninsula, spread over two plateaus along the eastern shore of the Cimmerian Bosporus. The city was a large emporium for all the traffic between the coast of the Maeotian marshes and the countries on the southern side of the Caucasus. It was the eastern capital of the Bosporan Kingdom, with Panticapaeum being the western capital. Strabo described it as a noteworthy city which was renowned for its trade. Shortly a Catholic Metropolitan Archdiocese while a medieval Genoese colony under the name Matrega, it remains a Latin Catholic titular see. Today the site is located at a short distance to the west of Sennoy in Krasnodar Krai, Russia. Another ancient Greek city, Hermonassa, lies 25 kilometres (16 mi) to the west, on the shoreline of modern Taman. Phanagoria was founded ca. 543 BC by the Teian colonists who had to flee Asia Minor in consequence of their conflict with Cyrus the Great. The city took its name after one of these colonists, Phanagoras. "The unusual nature of the Taman peninsula near Phanagoria, with its ravines, crevices, hills, and low cones of active volcanoes, must have impressed the ancient colonists even more than it impresses us today", Yulia Ustinova has observed. In the 5th century BC, the town thrived on the trade with the Scythians and Sindi. Located on an island in the ancient archipelago of Corocondamitis, between the Black Sea and the Palus Maeotis, Phanagoria covered an area of 75 hectares (190 acres) of which one third has been submerged by the sea. In the early 4th century BC the burgeoning Bosporan Kingdom subjugated much of Sindica, including the independent polis of Phanagoria. The town's importance increased with the decline of the old capital, Panticapaeum, situated on the opposite shore of the Bosporus. By the first centuries AD, Phanagoria had emerged as the main centre of the kingdom. During the Mithridatic Wars, the town allied with the Roman Republic and withstood a siege by the army of Pharnaces II of Pontus. It was at Phanagoria that the insurrection broke out against Mithridates VI of Pontus, shortly before his death; and his sons, who held the citadel, were obliged to surrender to the insurgents. An inscription found during excavations testifies that Queen Dynamis honored Augustus as "the emperor, Caesar, son of a god, the god Augustus, the overseer of every land and sea". The loyalty to Rome allowed Phanagoria to maintain a dominant position in the region until the 4th century, when it was sacked and destroyed by the invading Huns. By the 7th century, the town had recovered from a century of barbarian invasions. It served as the capital of Old Great Bulgaria between 632 and 665 under Kubrat. Afterwards Phanagoria became (at least nominally) a Byzantine dependency. A Khazar tudun was nonetheless present in the town and de facto control probably rested in Khazar hands until the defeat of Georgius Tzul in 1016. In 704, the deposed Byzantine emperor Justinian II settled in Phanagoria (then governed by the Khazar tudun Balgatzin) with his wife Theodora, a sister of the Khazar Khagan Busir Glavan, before returning to Constantinople by way of Bulgaria. 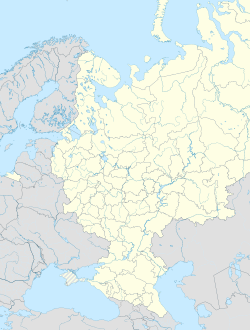 In the 10th century, the town seems to have faced an invasion, supposedly by the Rus. After that, Phanagoria could not compete in significance with neighboring Tmutarakan. In the late Middle Ages the town of Matrega was built on its ruins; the site was part of a network of Genoese possessions along the northern Black Sea coast. During the 15th century, it was the center of de Ghisolfi dominions. Henceforth there has been no permanent settlement on the site. The Genoese colony was canonically established on 1349.02.21 as Metropolitan Archdiocese of Matriga. It was suppressed around 1400 AD. The diocese was nominally restored as a Latin Catholic titular bishopric in 1928 under the name Matriga, which was changed in 1929 already to Matrega. Titular Bishop Rafael González Estrada (1944.05.16 – death 1994.03.07), first as Auxiliary Bishop of Quetzaltenango, Los Altos (Guatemala) (1944.05.16 – 1955), then Auxiliary Bishop of Guatemala (Guatemala) (1955 – emeritate 1984.05.29). The location of Phanagoria was determined in the 18th century, when marble statue bases with dedications to Aphrodite were discovered there. Hecataeus and Strabo mention a local sanctuary of Aphrodite as the largest in the Pontic region. Archaeological exploration of the site started in 1822, when "soldiers dug into a large barrow, making rich discoveries of gold and silver objects, many unique, which they divided up between themselves". Apart from the ancient city itself, archaeologists have been interested in a vast necropolis, which spreads on three sides around Phanagoria. There are thousands of burials, many with cypress or marble sarcophagi — an indication of the well-being of the ancient Phanagorians. Excavations conducted in the 19th century were for the most part amateurish; as many as twelve kurgans would be razed each season. Some of the most intriguing finds were unearthed in the 1860s at the Bolshaya Bliznitsa tumulus, classed by Michael Rostovtzeff as a feminine necropolis with three vaults. One of the royal kurgans near Phanagoria "has a stone stairway leading down to a rectangular passageway, the entrance to the burial chamber (3.70 × 3.75 × 4.70 m). These two areas are covered by an arch showing remains of painted decoration. The wall frescos imitate encrusted marble. On either side of the entrance to the tomb long stone boxes contain four horse burials along with rich grave gifts; saddlery and harnesses of gold and gilded bronze." Vladimir Blavatsky resumed excavations of Phanagoria in 1936. Among the recent finds is an inscription indicating that a synagogue existed in Phanagoria as early as 51 AD. Underwater investigation of the site has revealed multiple fragments of architectural structures. Prime Minister of Russia Vladimir Putin speaks after scuba diving at Phanagoria site. Vladimir Putin took part in scuba diving at the archaeological site of Phanagoria in the Taman Bay on 11 August 2011. Phanagoria Island in Antarctica is named after Phanagoria. ^ Ustinova, Yulia. The Supreme Gods of the Bosporan Kingdom. Brill Academic Publishers, 1999. p. 61. ^ D. Kendall, G. O'Collins, S. T. Davis. The Trinity. Oxford University Press, 2002. p. 30. ^ Ustinova, Yulia (1999). The Supreme Gods of the Bosporan Kingdom: Celestial Aphrodite and the Most High God. Brill. p. 29. ISBN 9789004112315. Retrieved 12 August 2016 – via Google Books. ^ North Pontic Archaeology: Recent Discoveries and Studies (ed. by Gocha R. Tsetskhladze). Brill Academic Publishers, 2001. p. x. ^ Quoted from The Princeton Encyclopedia of Classical Sites. (eds. Stillwell, Richard. MacDonald, William L. McAlister, Marian Holland). Princeton University Press, 1976. ISBN 0-691-03542-3. ^ Composite Gazetteer of Antarctica: Phanagoria Island. Morgan, Catherine (2004). Tsetskhladze, Gocha R. (ed.). Attic Fine Pottery of the Archaic to Hellenistic Periods in Phanagoria. Phanagoria Studies. 1. Leiden: Brill. ISBN 9789004138889. Tsetskhladze, Gocha R. (1997). "A Survey of the Major Urban Settlements in the Kimmerian Bosporos (With a Discussion of Their Status as Poleis)". In Nielsen, Thomas Heine (ed.). Yet More Studies in the Ancient Greek Polis. Historia Einzelschriften. 117. Stuttgart: Franz Steiner Verlag. pp. 39–82. ISBN 9783515072229. Tsetskhladze, Gocha R, ed. (1998). The Greek Colonisation of the Black Sea Area: Historical Interpretation of Archaeology. Historia Einzelschriften. 121. Stuttgart: Franz Steiner Verlag. ISBN 9783515073028. Panticapaeum was an ancient Greek city on the eastern shore of Crimea, which the Greeks called Taurica. The city was built on Mount Mithridat, a hill on the western side of the Cimmerian Bosporus. It was founded by Milesians in the late 7th or early 6th century BC. 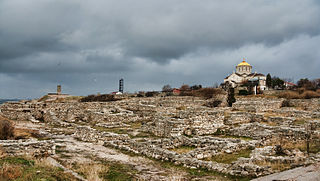 The ruins of the site are now located in the modern city Kerch. The Bosporan Kingdom, also known as the Kingdom of the Cimmerian Bosporus, was an ancient Greco-Scythian state located in eastern Crimea and the Taman Peninsula on the shores of the Cimmerian Bosporus, the present-day Strait of Kerch. It was the first truly 'Hellenistic' state in the sense that a mixed population adopted the Greek language and civilization. The Bosporan Kingdom became the longest surviving Roman client kingdom. The 1st and 2nd centuries BC saw a period of renewed golden age of the Bosporan state. It was a Roman province from 63 to 68 AD, under Emperor Nero. At the end of the 2nd century AD, King Sauromates II inflicted a critical defeat on the Scythians and included all the territories of the Crimea in the structure of his state. Chersonesus, in medieval Greek contracted to Cherson is an ancient Greek colony founded approximately 2,500 years ago in the southwestern part of the Crimean Peninsula. The colony was established in the 6th century BC by settlers from Heraclea Pontica. Tyritáke was an ancient Greek town of the Bosporan Kingdom, situated in the eastern part of Crimea, about 11 km to the south from Panticapaeum. It is tentatively identified with the ruins in the Kerch district of Kamysh-Burun (Arshintsevo), on the shore of the Cimmerian Bosporus. Myrmēkion was an ancient Greek colony in the Crimea. The settlement was founded in the eastern part of the modern city Kerch, 4 km NE of ancient Panticapaeum on the bank of the Kerch bay near the cape Karantinny. The settlement was founded by Ionians in the first half of the 6th c. BC. Nýmphaion was a significant centre of the Bosporan Kingdom, situated on the Crimean shore of the Cimmerian Bosporus. Today it is located near the resort town Heroivske/Geroevskoye. It lies at a distance of about 14 kilometers south of Kerch, which was the site of ancient Panticapaeum. Tiberius Julius Rhoemetalces Philocaesar Philoromaios Eusebes, also known as Rhoemetalces or Rhoimetalces was a prince and Roman Client King of the Bosporan Kingdom. Tiberius Julius Pharsanzes, also known as Pharsanzes was a prince and Roman Client King of the Bosporan Kingdom. The Crimean Peninsula was under partial control of the Roman Empire during the period of 47 BC to c. 340 AD. The territory under Roman control mostly coincided with the Bosporan Kingdom . Rome lost its influence in Taurica in the mid third century AD, when substantial parts of the peninsula fell to the Goths, but at least nominally the kingdom survived until the 340s AD. Byzantium, the eastern continuation of the Roman Empire, later regained the Crimea under Justinian I. The Byzantine Greeks controlled portions of the peninsula well into the Late Middle Ages. Aphrodite of the Gardens is an epithet of the Greek goddess Aphrodite. The epithet describes her patronage over vegetation and garden fertility.